A friend of mine was able (or should I say "unfortunately able") to watch the EURO semi-final between host France and Germany. Its back-to-back EURO semi-finals for him. 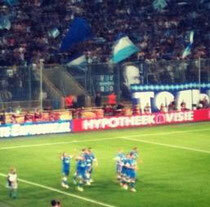 Also back-to-back EURO semi-finals defeat (So PLEASE dont visit the next one as well). It seems like passes, ball possession and penetration is all nice and good to have, but scoring goals is still the ultimate performance parameter. Anyway, it was still a good game from Germany and witnessing it seemed worth it, if you have a look at the picture I have received. If you have attended any football matches (of the EURO), in any country, any league in any age group - send it and I will post it. Like FC Bayern Munich, Red Bull Salzburg held its training camp in Doha 2014. Some training sessions can be viewed (HERE, HERE and HERE) and the following video shows bits and pieces from the goalkeeping training. True football fans go to football matches (even without their husbands). So did my wife. Can barely explain "offside", however, was invited to the VIP section for the home match of VFB Stuttgart against FC Augsburg. Was not the greatest day for Stuttgart, as they were bashed 4:1. If coaches/players/spectators want to share their stadium and crowds experience please email me the pictures. 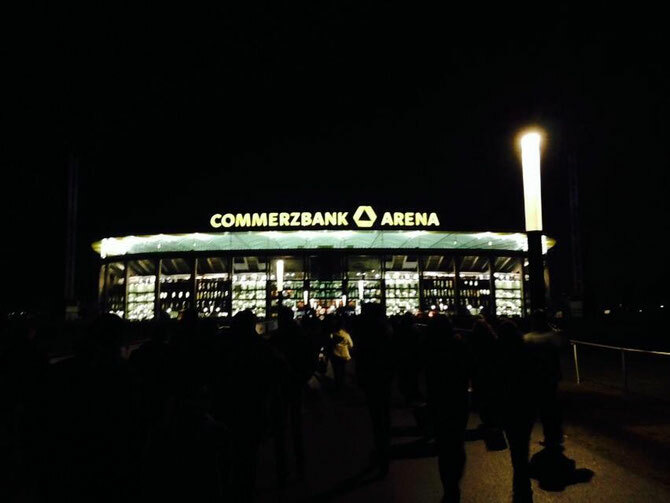 During my christmas vacation I was able to visit Eintracht Frankfurt playing their last home-game of 2013 against FC Augsburg. 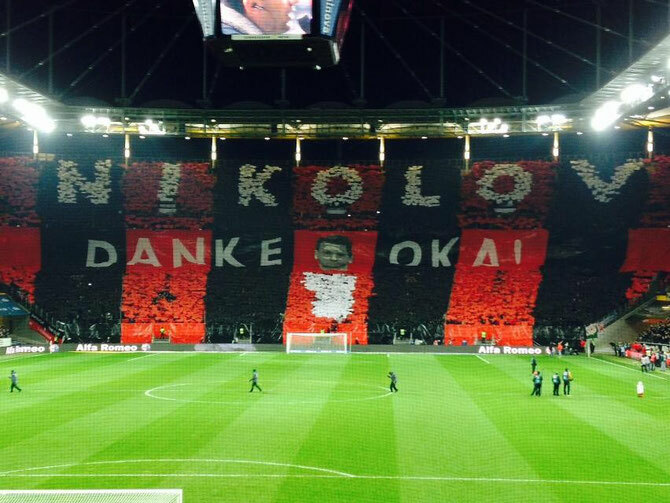 It was also the official fare-well celebration of Oka Nikolov who was the goalkeeper in 414 matches for Eintracht. 46.400 visitors saw a 1:1 draw. Eintrach Frankfurt is going to play its group match in the UEFA Europa League against Nikosia this Thursday. Just in time for the (hopefully) 2nd win in the group phase, we have prepared a compilation of the Frankfurt supporters. Stadiums and crowds are part of our non-s(ci)ence section on footballscience.net. As a result we have compiled (ultras) fans choreos from YouTube channels. Obviously we were dependent on the quality of the individual uploads. 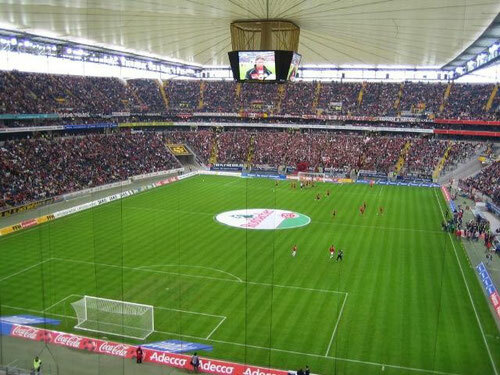 If you have (great) pictures of football stadiums and fans, send it to us and we will post it. Because its football, we are all fans and its just an exciting feeling to watch football live. Especially with the start of the college soccer season we would like to post some "stadiums and crowds" pictures from US-college teams. 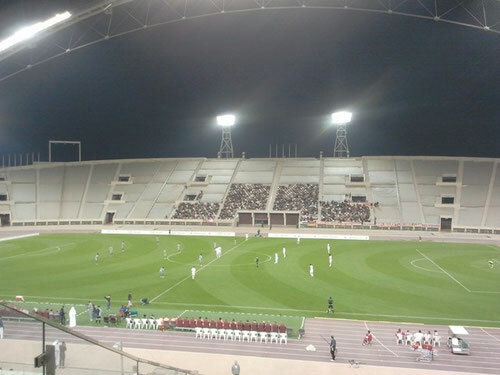 Last night, we have visited the U17 GCC (Gulf Cooperation Council) Championship game Qatar vs. Oman. Well, obviously there was not an impressive crowd. 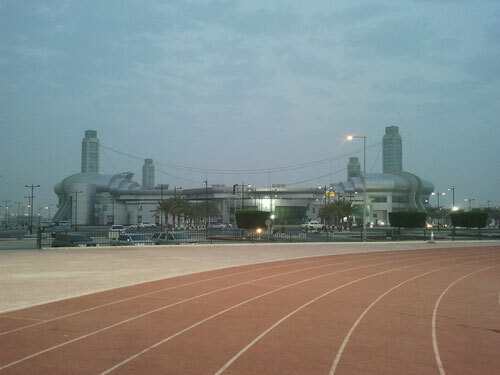 However, the Aspire academy still is. The result of the game was 1:0 for Oman. The video below shows the stadium(/house)-warming party for the Tele2 arena, the new multifunctional facility for the two Stockholm-based clubs Djurgårdens IF and Hammarby IF. We are not sure if all activities are legal, however it looks like the fans made it special. With the season ending approaching in many/all leagues around the world, we were able to attend the Emir cup final at Doha/Qatar between Al-Saad and Al-Rayyan. 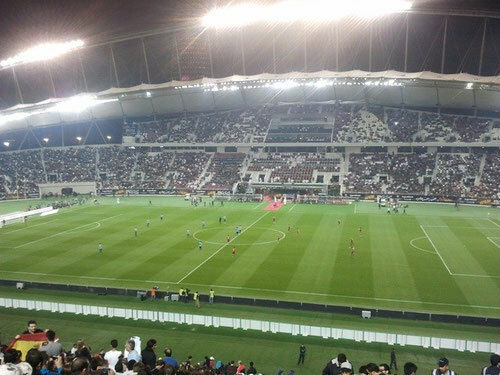 The stadium was sold out (40.000 visitors) and Al-Rayyan took the trophy with a 2-1 win. 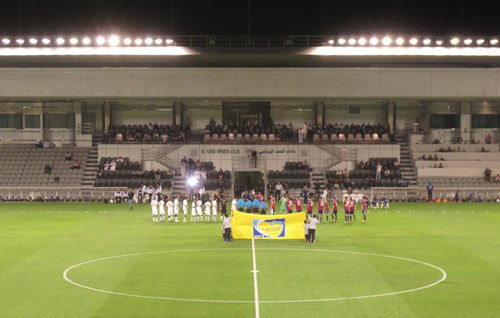 Al-Saad was chasing the match after they have conceded two goals within the first ten minutes. After that, Al-Rayyan focused on the defense to keep the victory. A firework after the match rounded up the 41. Qatar cup and showed (somehow) that Qatar is (improving) on a way to celebrate football as it is “normal” in other countries. It was the fastest Championship in Bundesliga history (with still 6 games to play). FCB's gap to 2nd placed and last years Champion Borussia Dortmund is 20 points. 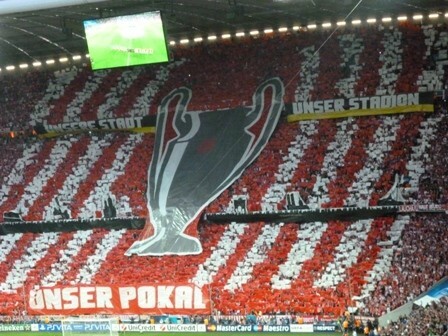 As a result the team from Munich can focus on the German Cup and the UEFA Champions-League from now on. Bundesliga history was made in Frankfurt this Saturday afternoon. Bayern Munich won their 24th match of the season (with 3 draws and 1 loss) and reclaimed the crown of the DFB Bundesliga for the 2012-2013 season. 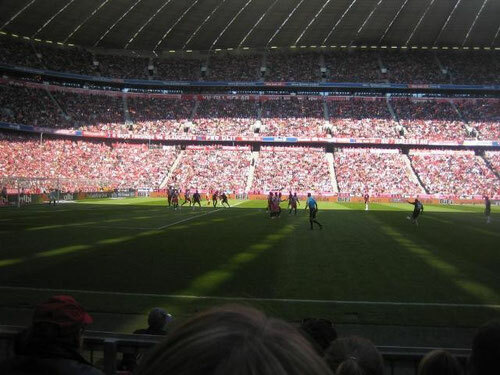 Schweinsteiger scored the only goal in the match against Eintracht Frankfurt, which was seen by 51.500 visitors in the Commerzbank arena at Frankfurt. 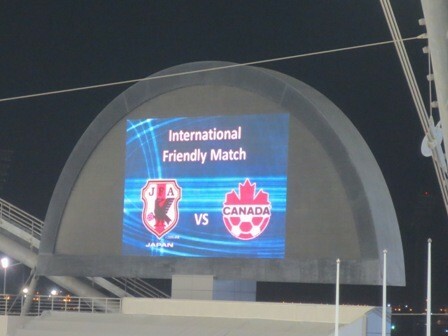 We have received some picture from the international friendly match Japan vs. Canada played yesterday in the Khalifa Stadium at Doha/Qatar. 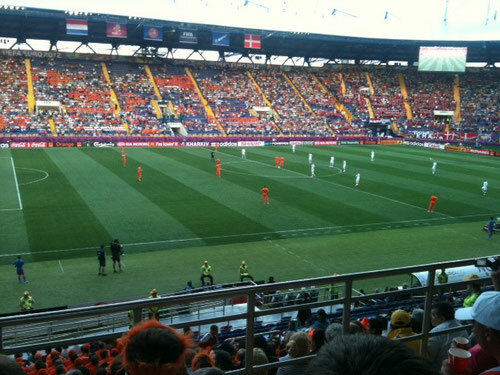 As it is possible to see, only half the stadium was open and approximately 3000 visitors saw the match. While having the greater physical appearance, the Canadian players put themselves on the back foot a couple of times after individual mistakes, resulting in a half time score of 1-0 to Japan. A free-kick from Japan only hit the cross-bar. The second half was little more open, Canada found more spaces and equalized. However the result after 90 minutes was 2-1 to Japan. Schalke 04 played Al-Saad SC as part of their preparation phase for upcoming Bundesliga and Champions League games. 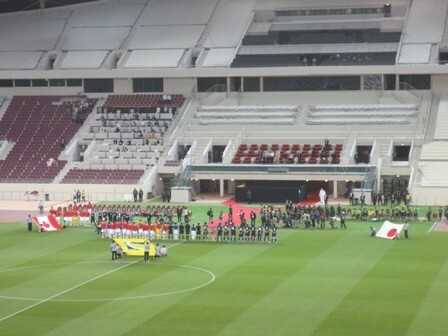 The game was played in the Jassim-Bin-Hamd-Stadion in Doha/Qatar and approximately 250 visitors watched it. Schalke took an early 2-0 lead, however faced a draw at half time. Raul the former Schalke player and Spanish national provided one assist for Al-Saad until he was substituted off with 15 minutes to go. Hoewedes scored the last goal of the match in which Schalke had to thank their two keepers twice to leave the field as the winne. 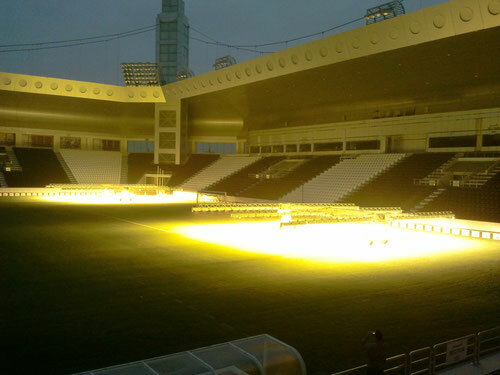 Interesting, not only the players had to recover after the game but also the field, which received special UV-light treatment directly after match. 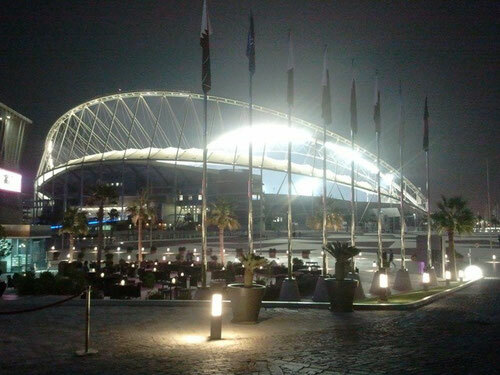 As part of their pre-season, FCB played Lekhwiya in the Khalifa International Stadium at Doha/Qatar. Bayern Munich won 4:0 and both coaches gave every player nearly 45 minutes game time. We can only estimate about the attendance (maybe 600), but the ~25 Bayern Munich fans brought a little bit of Bundesliga into the stadium. 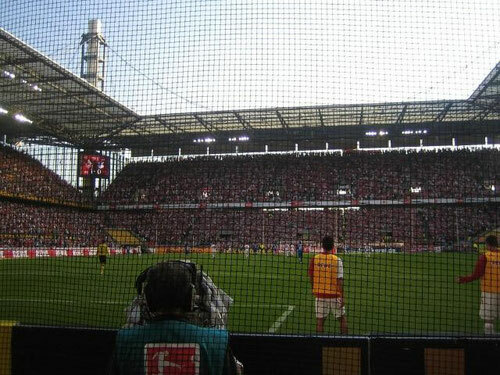 As you can see on the picture, nearly all seats of the stadium were covered to protect them from the sand. If anyone else can provide live pictures from game-days in any country from any stadium, please send it to us that we can share the experience here as well. While most of the Bundesliga clubs were already on christmas vacation, the round of 16 of the DFB cup started last tuesday/wednesday. 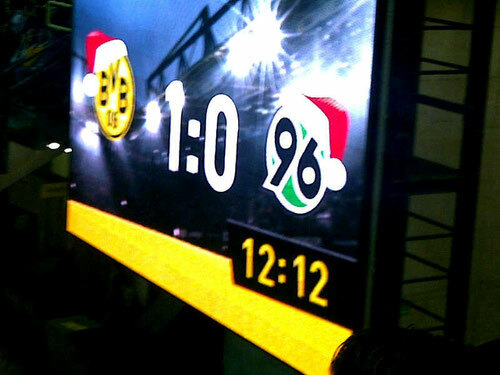 Henning Senf sent pictures from the game Borussia Dortmund vs. Hannover 96. 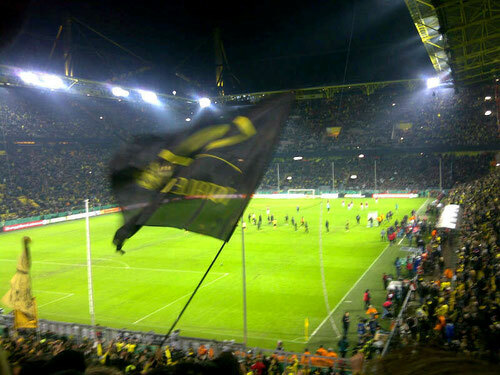 The game was played at Dortmund and the picture was taken from the BVB fan corner. 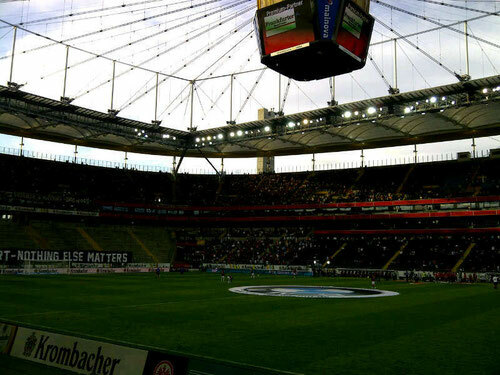 There was hardly any fan noise in the sold out arena (80.645) for the initial 12 minutes and 12 seconds, as the fans protested against the new safety concept "Sicheres Stadionerlebnis" of the DFB. The 12 minutes and 12 seconds were chosen in accordance to the day (12th of December) on which most of the clubs signed off on the DFB concept which is thought to result in a safer environment for fans. However, the fans themselves critics that the new rules would violate against personal rights. 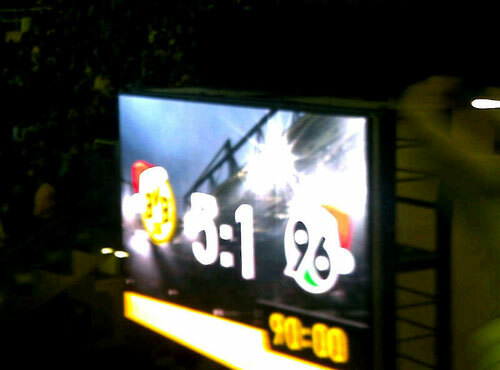 The BVB dominated the entire game and secured the next round in the DFB cup with a 5:1 home win. Thanks for sharing. If anyone can provide other live pictures from game-day attendances in any country from any stadium, we would like to present them here as well. Bayern Munich finally lost a match in the German 1.Bundesliga. Bayer Leverkusen took the three points from the sold-out Allianz Arena (71.000 spectators) at Munich with a very lucky 2:1 win. It seemed that Bayern Munich beat themselves that night as two defenders from FCB helped Leverkusen to score those goals. Additionally, Bayern could not capitalize on 23:5 shots on goal, 14:2 corners and 68:32 percent ball possession. The defeat did not really hurt them as they sit comfortably in first place with still four points ahead of Schalke after winning the first eight games of the 2012-2013 season. This winning streak also marks a new record in history of the Bundesliga. 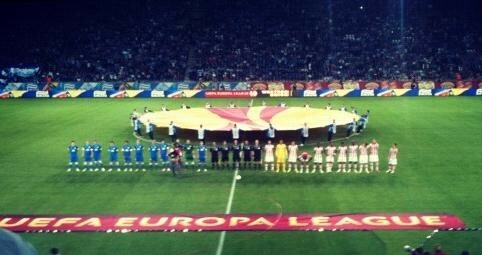 Albert Fernandez Caballeria visited the UEFA Europa League home game of FC Dnipro Dnipropretrovsk against PSV Eindhoven. It was a good night for the home team as they defeated PSV 2:0 and up to date they are leading the group F with six points. 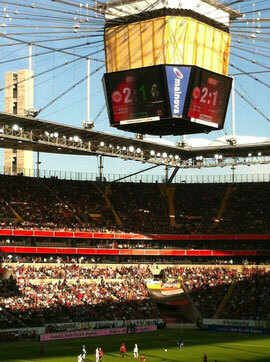 About 28.000 visitors saw the game and Albert reported that the weather was nice and the atmosphere great. While Bayern Munich suffered the first loss in the UEFA Champions League on last Tuesday, they are moving ahead unbeaten as the first of the table in the Bundesliga. Eintracht Frankfurt as the team that just got promoted from 2nd league last season, currently second place of the table with two points behind, presents itself more or less as the only team tailing Bayern. Five points behind Frankfurt is Dortmund the Champion of last season. It looks like the arena in Frankurt is the one to go these days. With the 2:1 win over SC Freiburg, Eintracht now holds the record for the best start of a team that just got promoted into first league in Bundesliga history. 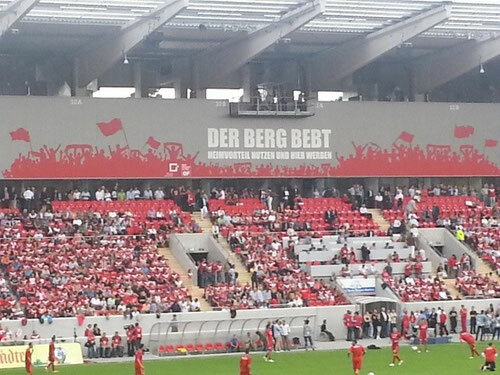 This week-end displayed the start of the 50th DFB Bundesliga season. 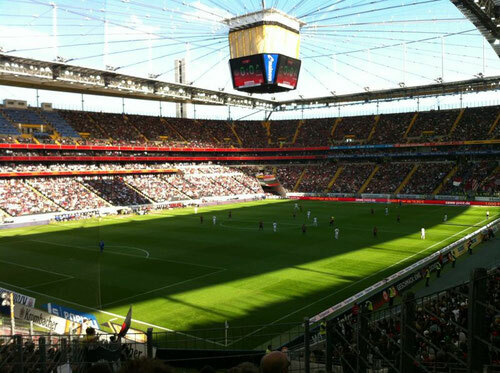 Henning Senf and Daniela Wilsdorf attended the first home game of SG Eintracht Frankfurt, who played against Bayer 04 Leverkusen. All people that I know are happy that Eintracht won 2:1. 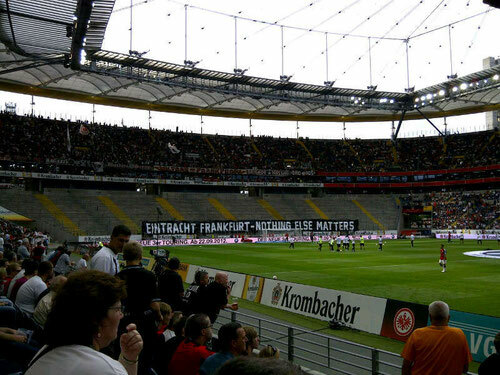 Due to restrictions/sanctions from the DFB, Eintracht Frankfurt were not allowed to use the home fan-corner. As a result there were only 29.750 visitors. 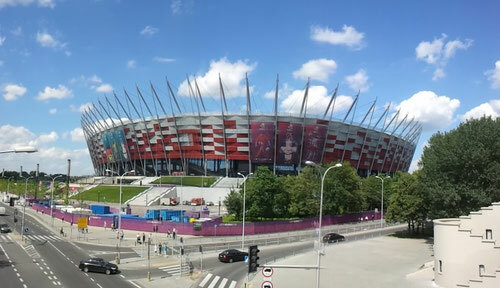 The second semi-final of the EURO 2012 was played in Warszaw. 55.540 visitors saw a better and clinical italian team. Germany lost 2:1. 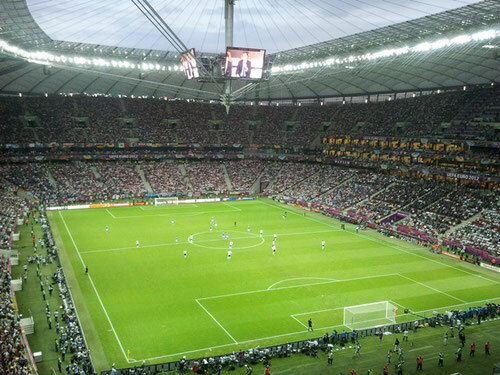 The 1:0 victory of Germany against Portugal of the EURO 2012. 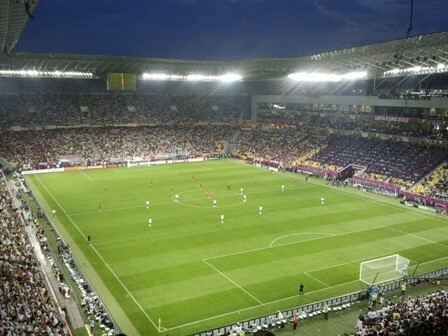 About 33.000 spectators (sold-out) saw a more or less "below average" game in which the Germans were happy to keep the result 1:0 to take their first 3 points in the group stage of the EURO 2012. One more UEFA Champions League Final to go !!! Yesterday was the first one (Women's) in Munich. On the picture you see the "historical" Olympic stadium at Munich - the old home of FC Bayern Munich. 1. 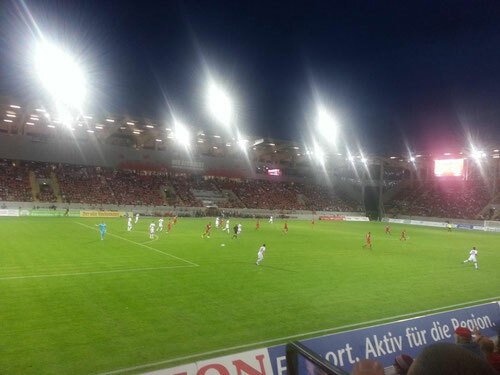 FFC Frankfurt played Olypmic Lyon, who took home the trophy. Check stadiums and crowds and see what you have missed. 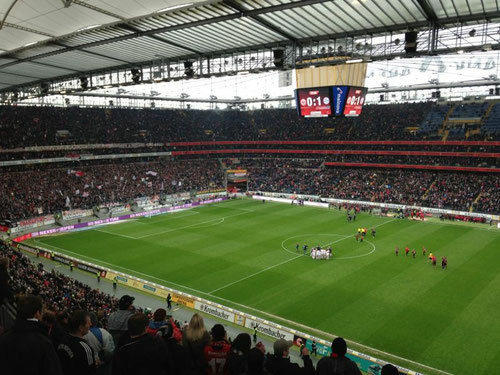 Frank Dubanec from www.11-p.com attended Cologne against TSG Hoffenheim at Rhein-Energy Stadium. 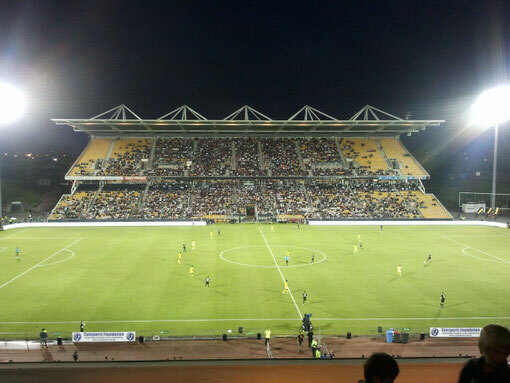 We do not know the result neither the total of attendances - it does not matter. Great picture. 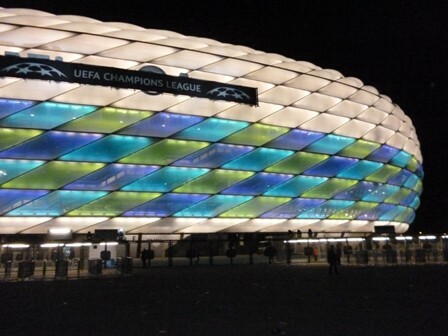 If you have (great) pictures of football stadiums and fans, send it to us and we will post it. Why? Because its football, we are all fans and its just an exciting feeling to watch football live.